This item is designed for weightlifting and pull-up, which makes up strength for building upper body strength. The material is sturdy, breathable, lightweight and durable. It can promote your practice performance and offer necessary protection. This is ideal for people who do weightlifting and pull-up training. ❤️HIGH QUALITY--Materials: PP & Metal. Made of premium materials, sturdy, lightweight and durable. ❤️PROTECT YOURSELF--Dual hooks design, makes up arm strength and offers protection. None Slip Grip. 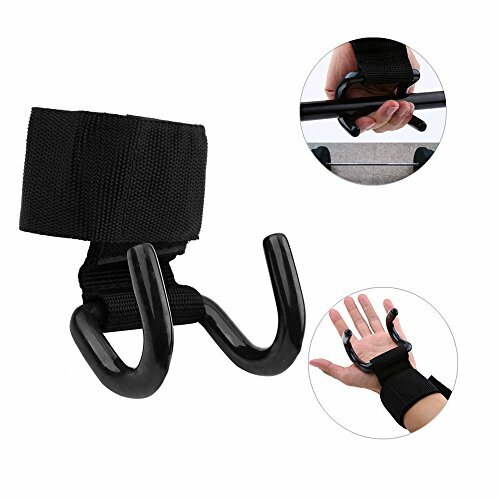 Padded Wrist Straps help prevent loss of grip and increases lift capacity. ❤️EXTRA STRONG HOOK DESIGN--Hook and loop design, adjustable for proper fit to most people. ❤️MAXIMUM COMFORT & SUPPORT--Strengthened strap for better tensile force and safety. ❤️IDEAL FOR SPORTS--A must for sports aimed for building upper body strength like weightlifting and pull-up.